One of the most critical mistakes beginner photographers make is using the 'Auto' modes on their cameras. While this is fine for simple snapshots, actual photography requires much more. AND, Whether you have a point-and-shoot camera or a digital SLR, mode settings between the two are pretty similar. Understanding these mode settings and how they work is one of the fundamentals of photography. You will never be able to take your shots to the next level unless you understand these settings. There are several different 'modes' on your camera that determine the level of automation which your camera will provide. These modes are generally adjusted by a dial located on top of your camera, and may range from fully manual, meaning you have control over every single aspect of the shot, to fully automatic, meaning the camera will control everything for you based on the current conditions. There are two categories (or 'zones') of modes, Basic (automatic) and Creative (manual), each of these zones make up half of the dial. Most dials have 'Fully Automatic' mode in the very center of the dial, marked by a green square. Basic modes are marked by icons which represent the primary use of that particular mode, and are generally accessed by turning the dial clockwise from fully automatic mode. Creative modes are marked simply by letters, and are generally accessed by turning the dial counter-clockwise from fully automatic mode. Modes which are typically located in the basic zone, but will vary depending on camera. Many cameras will not have all of these modes. Portrait Mode - Icon: A side (profile) view of a head. - This mode brings subjscts in the foreground into sharp focus, and may enlist the use of a larger aperture to blur the background. Landscape Mode - Icon: Mountains. - This mode is for taking shots of distant objects, or wide-angle shots, and will bring background objects more clearly into focus by setting a smaller aperture. Night Scene Mode - Icon: Icon containing a star. - This mode uses flash and a slower shutter speed to illuminate the subject and allow more light to enter the camera. Macro Mode - Icon: Flower. - Used for extreme close-up shots where the camera may have trouble focusing in other modes. Sports / Action Mode - Icon: Running person. - Use this mode for shots in which there is a good amount of motion which you want to capture without blurring. Movie Mode - Used to shoot low-quality movie clips on point and shoot digital cameras (this mode is not available on DSLR cameras due to the method of action which they use). Mainly a novelty mode, it can not be expected to produce anything of worthwhile quality. (Not shown on example picture). Modes which are located in the manual zone, and offer greater control and fine-tuning of your shots. Program Mode (P) - Much like an automatic mode, the camera will still do the majority of work for you, but offers you the option to manually override settings such as focus, while the camera manages the exposure. Program mode is decent for beginners who want to be able to get quick shots without putting too much thought into it, but still want a bit more versatility than an auto mode offers. Shutter Priority (TV) - In shutter priority mode, you are able to manually adjust the shutter speed while the camera controls the aperture and ISO. Aperture Priority (AV) - Aperture priority mode is similar to shutter priority mode, but lets you adjust the aperture, while the camera controls shutter speed and ISO. Manual Mode (M) - This mode provides the most control of all, as you are able to adjust every aspect of the shot. There is absolutely no camera assist in this mode. You are able to adjust aperture, shutter speed, and ISO for yourself. 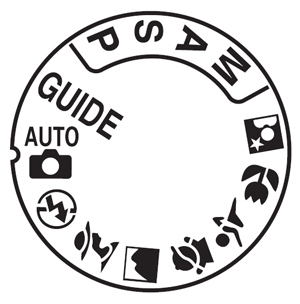 Most experienced photographers will exclusively use manual mode due to the level of customization it offers. Auto Depth of Field Mode (A-DEP) - A-DEP is a mode exclusive to Canon cameras, and will measure the depth of the nearest and furthest objects in the viewfinder when the shutter release is pressed half-way, and therefore is able to compose a shot with no blurring of the foreground or background objects which you focus on. A-DEP is complicated to use and generally not worth even attempting. Yes! Finally someone writes about access online streaming. 2010 DSLR Imagery . All right reserved.